Recombinant fragment within Human Calmegin. The exact sequence is proprietary. Human testis tissue. Jurkat cells. Jurkat, Human testis, mouse testis and rat testis lysates. Our Abpromise guarantee covers the use of ab171971 in the following tested applications. WB 1/10000 - 1/50000. Predicted molecular weight: 70 kDa. 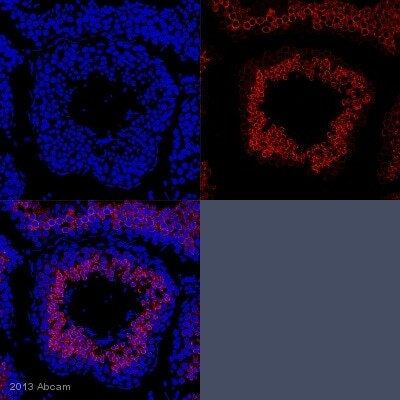 IHC-P image of Calmegin staining with ab171971 on tissue sections from adult marmoset testis. The sections were subjected to heat-mediated antigen retrieval using Dako antigen retrieval solution. The sections were then blocked with 5% milk for 30 minutes at 25°C, before incubation with ab171971 (1/500 dilution) for 18 hours at 4°C. The secondary was an Alexa-Fluor 555 conjugated goat anti-rabbit polyclonal, used at a 1/500 dilution. Immunofluorescence analysis of Jurkat cells, labeling Calmegin using ab171971 at a 1/50 dilution. Immunohistochemical analysis of paraffin-embedded Human testis tissue, labeling Calmegin using ab171971 at a 1/100 dilution. ab171971 showing -ve staining in Human normal brain tissue. ab171971 showing -ve staining in Human skeletal muscle tissue. ab171971 showing -ve staining in Human normal tonsil tissue. ab171971 showing -ve staining in Human normal lung tissue. Western blot analysis on immunoprecipitation pellet from Human testis lysate, labeling Calmegin using ab171971 at a 1/10 dilution and an IgG control. Publishing research using ab171971? Please let us know so that we can cite the reference in this datasheet.